Nothing better than to start the month with some new Yarn. 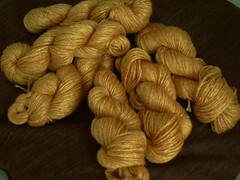 This economy has put me on a yarn diet, but it has made me more picky. I am actually buying yarn for possible projects. I think you should go and check this store out, I liked the ran that I got from them is not ultra soft, but it feels like good quality and the store's feedback speaks for itself. I order another one of this in black, well, I actually went into an auction. Still they do have some nice lots of wool for Buy it Now prices, This is all for today, thanks for stopping by!